In the next few weeks we will begin conservation of Big Wave, Gateway to Santa Monica , a major public artwork by renowned artist Tony Delap. 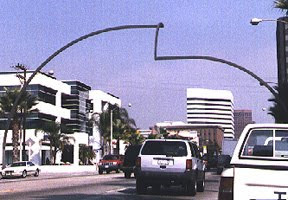 Designed and built in 1989, the 40' high painted steel sculpture, which spans Wilshire Boulevard at the 3200 block in Santa Monica, was commissioned by the City of Santa Monica 1% Percent for Art Program with contributions from the National Endowment for the Arts and the Santa Monica Arts Foundation. It is composed of painted mild steel which will be repainted, and fiber optic lighting and Plexiglas lenses which will be replaced with more sustainable LED lights and Lexan lenses, respectively. Work will be done under the auspices of the Cultural Affairs Department of the City of Santa Monica, in full consultation with the artist, and in conjunction with Exclusive Welding, Inc., general contractors with a specialty in fabrication, installation, and restoration of public art. Stay tuned for more posts on this exciting project.